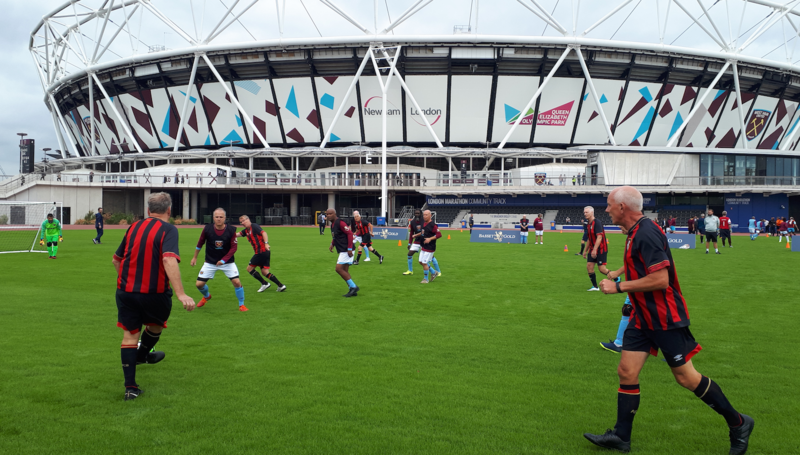 As West Ham United's official shirt sleeve partner, we were keen to initiate and be the catalyst for the new match-day Walking Football Tournament, demonstrating our commitment not only to the Premier League's East London Team, but also to the ethos and health benefits of walking football - and our business spirit. As West Ham United's official shirt sleeve partner, we were keen to initiate and be the catalyst for the new match-day Walking Football Tournament, demonstrating our commitment not only to the Premier League’s East London Team, but also to the ethos and health benefits of walking football – and our business spirit. 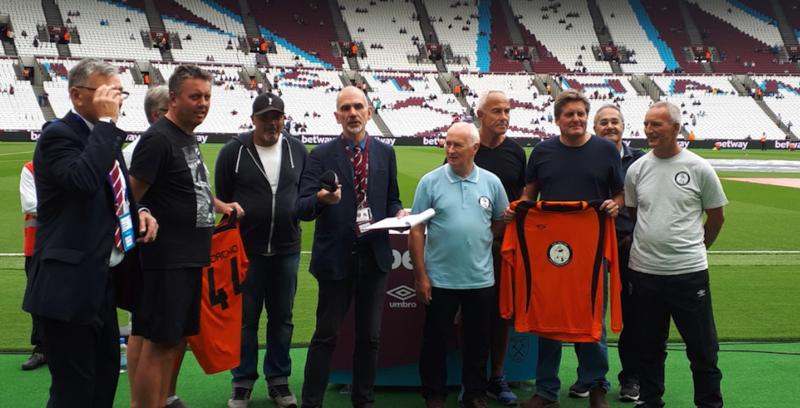 West Ham Foundation Walking Football team and visiting Bournemouth Walking Football team line up in advance of the tournament on match day (Sept 2018). The newly introduced Basset & Gold Walking Football Tournament brings together West Ham United teams, others across the community, and Premier League teams across the country, giving them the opportunity to play against new opponents, meet new people and improve their skills while playing football differently. The new Walking Football Tournament, made possible by Basset & Gold's commitment and encouragement to the activity, takes place ahead of every home Premier League fixture at the London Stadium, where West Ham United's Walking Football team, a visiting Premier League club and two more community teams play on West Ham's London Marathon Community Track. The teams battling it out on theLondon Marathon Community Track in front of the majestic London Stadium, desperately trying not to run. During each home match day, a round-robin tournament is played incorporating local and community teams. Each team is made up of six players and each match lasts eight minutes. After each tournament, the winning team is presented with a trophy and their players are given individual medals to mark their success during half time, awarded to them by a 'West Ham Legend'. 'Basset & Gold Walking Football Tournament' winners' medals and placard. The Basset & Gold Walking Football Tournament is a slow-paced, non-contact version of the game aimed at over-50s. It is designed to help people maintain an active lifestyle, regardless of age or injury. What appealed to us was finding out that all the walking football clubs across the country are acting only within their community with limited exposure, and we felt that our sponsorship is a great vehicle to bring all these teams together and create the first ever country-wide Walking Football Tournament with the aim to grow it on a larger scale. Now with our active involvement, Premier League club backing and local authority support, this is a partnership that is attracting people who have enjoyed sport all their lives to once again safely get back into playing, and also introduce the game to people who may have never considered playing before. Among the supporters of the initiative is TV Doctor Hilary Jones, presenter and writer on medical issues. On finding out about our involvement in the tournament, Dr Hilary commented, "When I became aware of Basset & Gold's Walking Football Tournament, I thought it was an excellent initiative. It's an engaging and healthy way to encourage an active lifestyle among the over-50s, yielding great benefits for mental and physical health. It's very encouraging to see companies like Basset & Gold pledging their support." Find out more today about our commitment to WestHam United and the Foundation on our supporters web pages, where you can find out more about our latest news, features and offers. To learn more about the West Ham Foundation, delivering projects that help tackle some of the key health challenges in Newham, watch their video about 150Club's walking football.